July | 2012 | ohdenny. 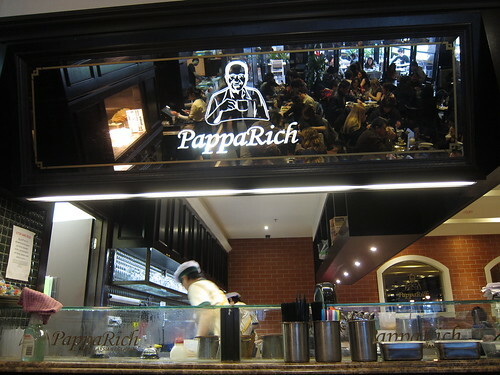 PappaRich QV was the first franchise to open in Victoria before the Chadstone and Doncaster stores and since its opening earlier this year. I avoided the restaurant for months because usually the curiosity factor is high and the management work out the kinks of the service and etc. Even after many months, the QV store is extremely popular. 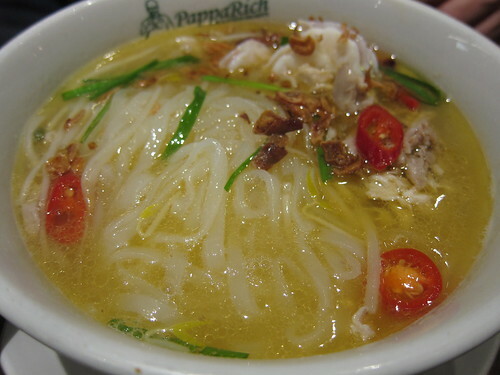 We ordered the Ipoh Hor Fun with Prawns & Chicken Strips, and it was quite pleasant tasting. 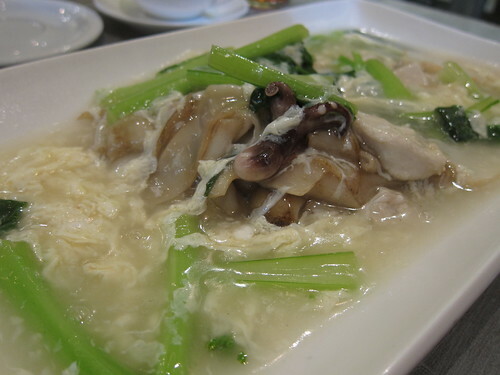 The soup was seasoned well, and with the large chillies and chicken pieces, it all came together nicely. 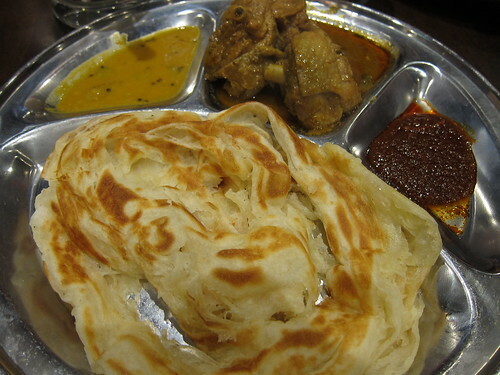 Their Roti Canai with Curry Chicken is a departure from the usual Roti Canai’s you would find elsewhere or from those frozen packets in Asian Groceries. What makes it so different is that the Roti here is extremely dry, but crisp and crunchy nonetheless. The ones you would find in most other Malaysian restaurants are layered, oiled and although crisp on the outside, it would be soft and pull-apart inside. The Curry Chicken accompaniment was reasonably tasty, but with the chicken being all bones and skin it was a tad disappointing. The Dahl is surprisingly good, but nothing really out of the ordinary from what you may find in ChilliPadi Mamak in Flemington. The real highlight of this dish is the sambal, as I mentioned in the Chadstone review, it has all the right things. A bit sweet and a huge kick of heat. Probably could eat that all day. 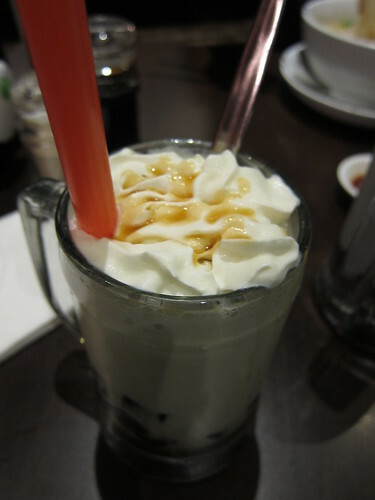 Their drinks menu is extensive with a lot of variety, we ordered the Soya Bean with Grass Jelly and it was extremely delicious. Not too sweet, and just the right amount of creaminess. Would order again! 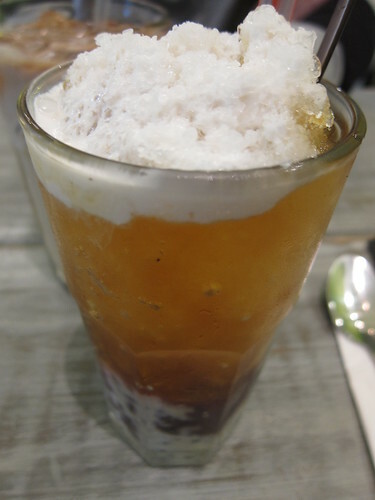 Their Iced Red Bean drink was also quite nice, with their sugared Red Beans at the bottom with shaved ice. Not overly sweet but still sweet enough for those sweet tooths. Service here was decent, food came quick enough. My main issue here is that when we requested for some extra sambal, they wanted $3 for basically one spoonful. I’m not sure if this is consistent with the Chadstone and Doncaster stores, but when we did ask fore more sambal in Chadstone, and we were not asked to pay for it. We did mention this to the staff at the counter when paying, and he said that this was something the management from the PappaRich franchisor have decided upon. Can’t say I’m that impressed with this decision to be honest. Not the best way to treat your customers when you start micro-charging them. Alas, can’t do anything about it though. Will see if Chadstone have started charging next time we visit. Would I go back to PappaRich QV? Maybe not. We didn’t have the best experience here, the food was a slight letdown, definitely less tasty compared with Chadstone. 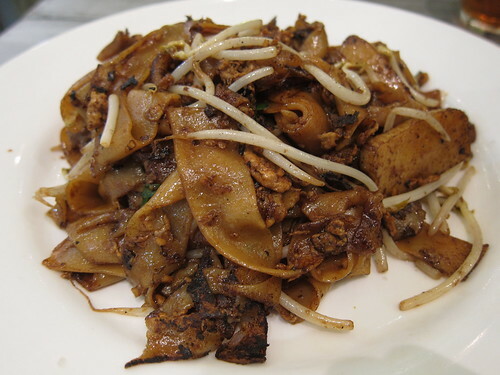 Plus there are plenty of Malaysian restaurants to choose from in the city. Sometimes we have plentiful of ripe (or overripe) bananas and we are left with the decision of what to do with them. I have already two banana recipes, Banana Cake and my One Ingredient Banana Ice-Cream. For a morning meal, I found a very nice recipe for Banana Wholewheat Pancakes that goes extremely well with some Canadian Maple Syrup. This recipe is from AllRecipes and I like it because it’s fluffy, but also slightly more healthier (without the maple syrup of course) because it uses wholewheat flour and oats which add another textural component to the pancakes. Check out the recipe below! 1. Place the rolled oats into the jar of a blender and blend until the texture resembles coarse flour. 2. Whisk together the blended oats, whole wheat flour, all-purpose flour, brown sugar, dry milk powder, baking powder, baking soda, and salt in a bowl; set aside. 3. Whisk together the egg, milk, vegetable oil, and vanilla. Stir in the mashed banana. Pour the egg mixture into the flour mixture and stir just until moistened. Let the batter stand for 5 minutes. 4. Heat a lightly oiled griddle over medium-high heat. Drop batter by large spoonfuls onto the griddle, and cook until bubbles form and the edges are dry, about 2 minutes. Flip, and cook until browned on the other side. Repeat with remaining batter. One of the comments on AllRecipes suggests that instead of adding brown sugar, you can add another mashed banana for that added sweetness. This will make the batter slightly dense and less fluffy but as shown in my picture above, it’s still reasonably fluffy. The original recipe only asks for one banana but two medium sized bananas seems to work quite well with no sugar. Of course, the sweetness of the banana doesn’t match the sweetness the brown sugar would, but if you are planning to add some golden syrup or maple syrup later on, then the brown sugar isn’t necessary at all. You could also make the batter overnight if you don’t have time in the morning. The minor issue with this is that the oil starts to split from the batter. A gentle mix through again is all that’s needed. This recipe has become my go-to pancake recipe but also made plenty of times when we have too many ripe bananas. 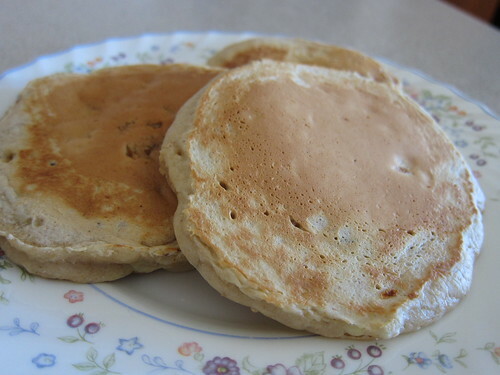 The whole wheat flour adds a bit of graininess to the pancakes but a pleasant taste to it as well. If you’re interested in a slightly different type of pancakes that still retains its fluffiness, this is the one to try! 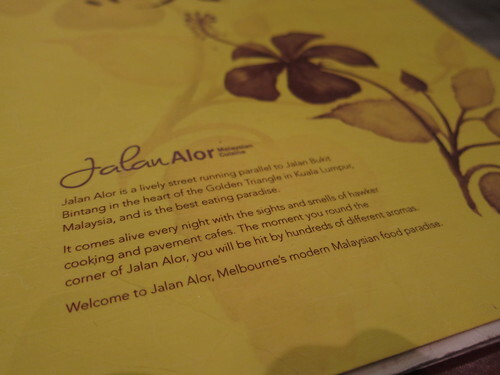 Jalan Alor is small Malaysian restaurant in Melbourne’s China Town. It’s part of the renovated walkway that once held Village Cinemas, if you can remember that far back! At times you might be hard pressed to find seating as this restaurant seats is extremely low. If you do get a chance to eat here, it is worth it. 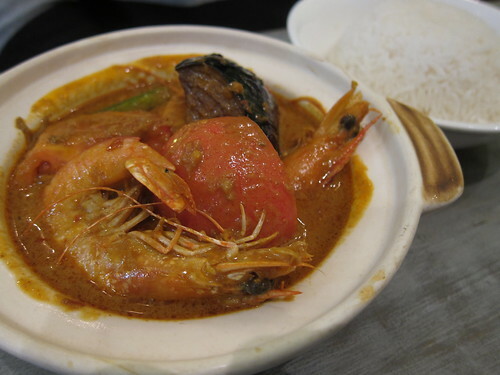 Their Curry with King Prawns tastes just as good as it looks. With the tomato and eggplant giving it a nice flavour, along with the pleasant curry taste. It is a surprisingly good dish to order. I found the Char Kway Teoh on this occasion to be slightly overcooked. It had a slight burnt taste to some of the noodles but it didn’t spoil the whole dish so I set the few strands of noodles aside. Other than that, it was quite tasty. It had the crispy lard that not many places cook with so that sets it apart from other Malaysian restaurants. I asked for spicy but it was not spicy at all so not sure what happened there. Overall, it was nice but there are some let downs as I mentioned before. Their Char Hor Fun was quite nice. There are some varying styles of this dish, some don’t cook the kway teoh in the wok as much (or at all) but I prefer it when they do. Jalan Alor does this and it’s great. It has that nice “wok flavour” as some puts it. The egg base sauce is also tasty. It is definitely hard to do a bad egg sauce though. Iced Red Bean Drink with Coconut Milk is also another winner. It’s not too sweet, nice and chilly on a warm day. The red beans add the sweetness to the drink, and the coconut milk add that creaminess. I’d order it again! The food at Jalan Alor is quite good, along with their drinks. However, I found their service to be slightly lacking. The waitress’s didn’t know what fresh chillies are. For a Malaysian restaurant, I feel that’s severely disappointing. When we asked for a plate to put the rice on for the Curry with King Prawns dish (the bowl was too small! ), she didn’t know what we were talking about and had to ask another one of the staff. The other staff asked if we would like a small plate and it seemed like it was a lot of effort for them to bring one out. Other than that, I’d go back again. I have been there a couple of times, but this was my most recent experience. Van Mai is another popular Vietnamese eatery along the bustling Victoria Street, Richmond. In my attempt to seek out and try many of the Vietnamese Restaurants in Richmond, Van Mai on Urbanspoon seemed like a very popular place to try. They have a wide selection of dishes to choose from but of course, I had to choose my favourite Vietnamese dish (or as close to). I love Crispy Chicken with Tomato Rice at Walrus (Springvale) and so my adventure to try out a dish that matches or even possibly tops that dish begins. Van Mai doesn’t have Crispy Chicken withTomato Rice but they do have Diced Pepper Beef with Tomato Rice dish. I absolutely loved the flavour of this dish. 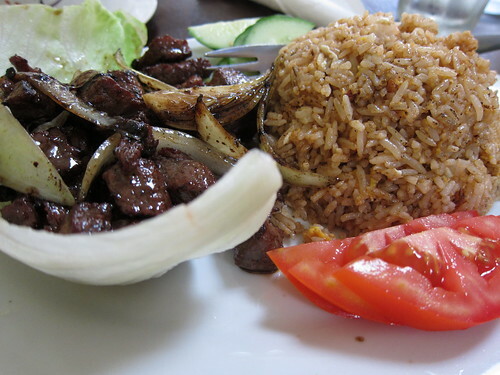 The beef was packed full of flavour, it was slightly sweet, nicely marinated and had a pleasant pepper taste that didn’t overwhelm the natural beef flavour. One little con was that it was a tad too salty but eaten with the fresh lettuce, tomato and cucumber it balanced things out. I pretty much only order Crispy Chicken with Tomato Rice because of the Tomato Rice. At Walrus it’s a vibrant red colour with stir fried with egg, at Van Mai it’s slightly darker and oilier. However, the taste is almost identical. Again, my only complaint is that it’s a tad too oily and I was wiping my mouth with a napkin constantly. Other than the oiliness, the food they serve is delicious. Would definitely come back to try their other dishes.